Dang Skippy! Those are some fun looking concepts. I also doubt either will see production, but that's ok. It's still nice of them to make these "what-if" toys, and after Moab I hope they find their way to Ouray in July too. It's been known to happen, haha! The pic for the 5/4 doesn't show up for me in your post, but a quick Google search showed the updated nukaiser, still gorgeous! Its actually not the Nu-Kizer. Its an actual M715, frame and all. Found some more pics. It's got gas cans in the bed labeled "Gin" and "Tonic", haha! I don't really know what's going on with that transmission tunnel, it looks fake in the pics, but I'm not real familiar with the modern gearboxes. The seats look amazing, and I'd expect an office chair with the same treatment to be about $500. Swanky! Of the other concepts, I like that the "Wayout" and "Gravity" can be replicated by anyone with enough cash and a Mopar catalog. I like that the bro'dozer dorkmobile version is literally named the "Flatbill". 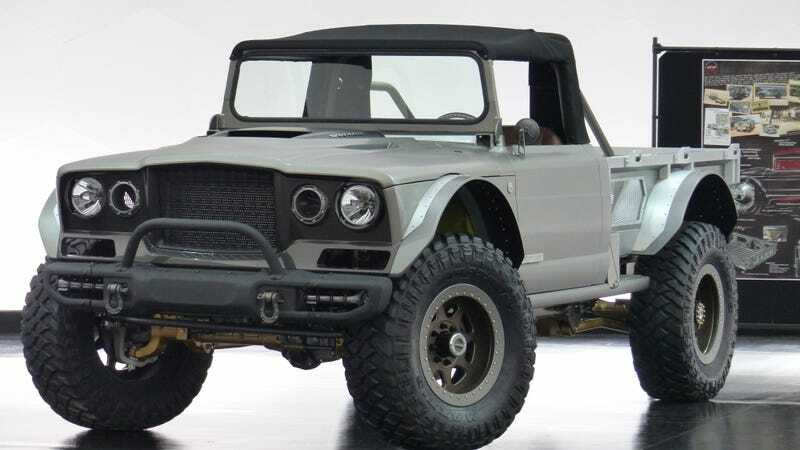 Of all the concepts, I think my favorite is the Scrambler. It's probably just those colors from my own childhood, but I want to put those stripes on all the white Jeeps I already own, haha! I really hope that they swing by for the Toyota Summit (I think they're dropping the "FJ", but haven't heard or looked) because I'd really like to see these up close and in person. I like em! Last edited by REDONE on Tue Apr 09, 2019 7:16 am, edited 3 times in total. REDONE wrote: Found some more pics. It's got gas cans in the bed labeled "Gin" and "Tonic", haha! I don't really know what's going on with that transmission tunnel, it looks fake in the pics, but I'm not real familiar with the modern manuals. And it turns out the M715 uses the factory frame that has been boxed. Dynatrac D60 front and D80 rear with coil overs. Hellcat engine. Its really very cool. The color name for the yellow stripe is "nacho". I want everything I own to be that color now. I'm kinda diggin' the "Wayout". 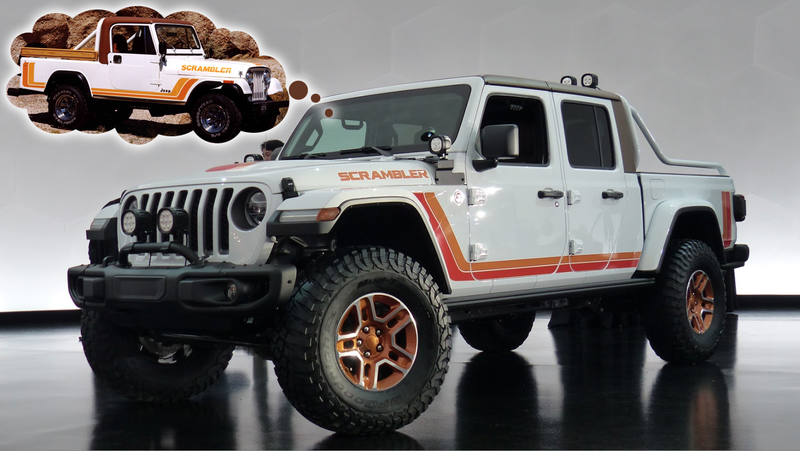 I think they got the J6 and the scrambler mixed up. The scrambler should be the 2 door one. Not much better looking in person. derf wrote: Not much better looking in person. I dont hate it but I think it should have been a 2 door. 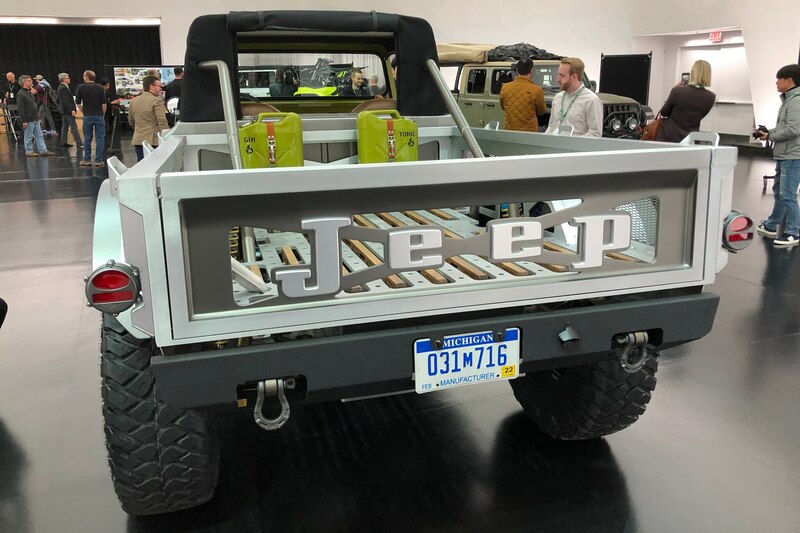 Last edited by tedlovesjeeps71 on Tue Apr 16, 2019 7:31 pm, edited 1 time in total. Cool!! It's on my bucket list. It's not as crowded as I thought it was going to be. derf wrote: It's not as crowded as I thought it was going to be.